Our loyal readers will know that we have published several articles extolling the virtues of the new ExecuteSQL function in FileMaker 12. Well, now it’s time to come clean and tell you the truth about this powerful function and its hidden ability to turn your hair prematurely grey, cause you to lose sleep, or perhaps develop an annoying and embarrassing facial tick. If you intend to embark on the rewarding path of integrating SQL into your FileMaker development, be warned. And be prepared, as one simple punctuation character, innocent in all other contexts among our many human languages, may lead to premature aging. This character is the lowly question mark (? ), and is the only feedback provided by the FileMaker calculation engine when you write malformed SQL statements within the ExecuteSQL function. SQL queries must be syntactically perfect in order for them to work. When you start writing SQL in FileMaker, you are stepping out of the safety of FileMaker’s tightly controlled programming environment that, for example, does not allow you to specify fields, scripts or other objects that don’t exist in the system. Fortunately for you, I have sacrificed some of my naturally colored hair and a few precious minutes off of my lifespan to bring you some useful tips for surviving the FileMaker/SQL learning curve. Most notably, I want to explore how to use the script debugger and data viewer to assist in the debugging of your SQL queries. Anders Monsen introduces some SQL ideas in this post. W3Schools.com has a decent SQL beginners tutorial available. FileMaker’s ODBC/JDBC Guide has useful reference information, including a list of those dreaded SQL reserved words. WHERE type = " & type & "
AND id_Person = " & pID & "
I then open the script, grab the calculation from the step, and drop it into the data viewer. Since the script is currently running, I am assured that all of the conditions of layout context and field/variable values that may be used in the calculation are in force. I then use the Let function to return the values of the various elements in the calculation by uncommenting them in the data viewer. Once you have started creating SQL queries in FileMaker that actually work, save them in a library. I use Notational Velocity to maintain my library of valid, working SQL queries. Having this as a resource is extremely valuable when it comes time to create a new query of particular type or style that already exists. It is perhaps the most valuable method for debugging SQL – which is simply using proven calculations – and makes it much more likely that your SQL queries will not be buggy and lead to that dreaded, hair-greying, insomnia-producing and lifespan shortening punctuation mark. I wish you the best of luck in the hard work of learning SQL. Post a comment if you have any questions! One of the new all-the-rage features in FileMaker 12 is the new ExecuteSQL function. When I heard about this new function and its potential to massively simplify the graph, I decided I did not want to wait to convert my customer’s School Management Solution to FMP12 and elected to use the free BaseElements plugin to access the FileMaker internal SQL API in FileMaker 11. Some months and many hours of learning curve time later, I was able to successfully implement SQL queries in many areas of my customer’s solution. Since I am using a plugin in a FMP11 solution, I took advantage of the opportunity to use SQL Insert, Update, and Delete queries to create, modify and delete records without having to create any schema to support the actions. As a result, I created very few additional relationships and was able to write significantly shorter scripts as I implemented several new features for the customer. After deploying the SQL-enabled solution, we encountered a nasty performance issue over the WAN. This solution has a person table with 20,000 records and a related Event table with 80,000 records. Every time the remote WAN user added a new event, FileMaker would freeze for as long as 5 minutes. This issue could not be replicated for LAN users. Debugging revealed that after the event was added, the very next script step that performed a SQL Select on the Events table was the source of the long delay/freeze. Unfortunately, this change did not significantly affect WAN performance, as there was still a minutes-long delay when this calculation was evaluated. At this point, in the interest of getting this bug fix delivered to the client as quickly as possible, I elected to abandon SQL as a technique for this particular function in the database. To that end, I returned to a good, old-fashioned, multi-predicate FileMaker relationship that would serve the purpose of finding all of the related event records that were considered valid as per the business rules of the customer. Lesson learned in this case is to consider all possible solutions when debugging and optimizing a solution. In this case, the new, fancy FileMaker feature would have required more time than was of value to the customer, and so I resorted to a more conventional approach rooted in the pure FileMaker techniques. Ultimately the priority was to serve the customer with a timely resolution of the bug – a simple case of the end result (delivering value to the customer) trumping a focus on the underlying technology. Stay tuned for a followup to this blog post where I elaborate on the technical solution to the slow SQL query. In this session from the 12 Days of FileMaker 12, we explore over a dozen new functions in FileMaker 12. The new features include improved container fields, new window styles, and a new plug-in updating methodology. 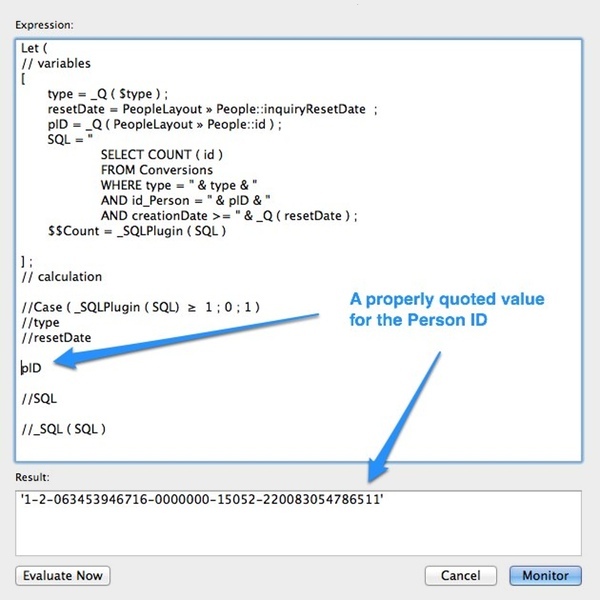 It doesn’t end there, as there is a pair of functions that deal with ID values, some FileMaker Go specific functions, and native access to FileMaker’s SQL engine with the ExecuteSQL function. 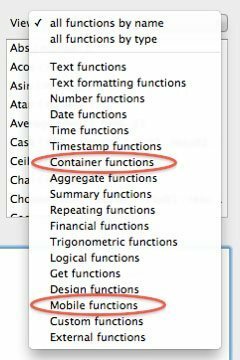 Two new categories appear in the calculation dialog: Container Functions and Mobile Functions. The former provides the ability to get the height and width of content in containers using GetHeight( ) and GetWidth( ) functions. It returns height and width in pixels for images. Other items in the container field, such as movies or files, return 0. In addition, we have the ability to generate a thumbnail of an image with the GetThumbnail( ) function. Since FileMaker 12 now enables us to store containers in external folders, checking the validity of the stored data reveals whether this has been changed or tampered with outside of FileMaker. Using VerifyContainer( ) shows 0 or 1 depending on whether the files have changed or not. Both functions accept two parameters, one required and one optional. The first is the accuracy of meters, and the second is the length in seconds allowed before timeout. Another new feature in FileMaker Pro 12 radically changes the method to update plug-ins. Previous versions managed this through a daunting and often complex AutoUpdate process via FileMaker Server. There is now an Install Plug-in File script step, and a function to return a list of currently installed plug-ins: Get( InstalledFMPlugins ). This result includes the plugin name, version, and current state – Enabled, Disabled, or Ignored. The publisher must enter the version number in the resource file (Windows) or info.plist.file (Mac), so keep this in mind when setting up this process. The new pair of ID functions each return a long string of alphanumeric characters but are completely different in purpose. Get( UUID ) returns a universal unique identifier, a unique 16-byte string in the format 8-4-4-4-12, such as E10FD6CB-2CB3-471A-B4B5-3CC2509F49EE. This function lets users create unique keys and avoids key collision when merging records from multiple tables, for example. Meanwhile, Get( PersistentID ) captures the unique identifier of the device accessing your solution, either desktop or mobile. Whereas you still can get the account name or username, the new string like AF376F280690001931BFED4E890FADDB shows the device ID. Along with some new tab control script triggers, there are two new functions. When coupled with the script triggers, navigating from tab to tab will return values via these functions. The first shows the originating tab panel (number and object name) and the second the current tab panel (number and object name). The naming can be confusing when going to a new tab, so “current” is the actual target. Still, with these values we have a way to track and control navigation between tab control panels. A new feature in FileMaker 12 is the ability to have two new window states. Previously new windows were document windows. If you wanted to prevent the users from closing them, you needed to set up a script, pause and then start the script again, or use script triggers. 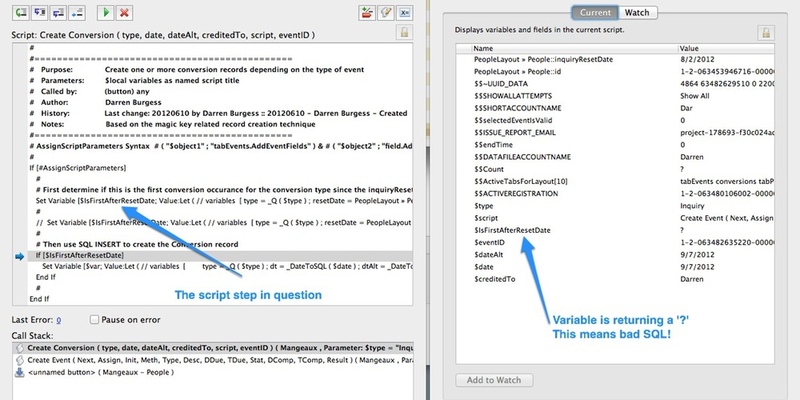 Finally, a function that deserves a webinar all on it’s own, and in fact FM Academy just had such a webinar: Greg Lane’s walk-through of the ExecuteSQL( ) function. The sqlQuery is the SELECT statement, placed inside double quotes, such as “select first_name from contacts”. The fieldSeparator and rowSeparator default to a comma and return when you use “” for the parameters. You can use other separators such as tab, pipe, etc. The optional arguments parameter lets you use a record’s field value as a parameter, useful when querying the context of individual records. 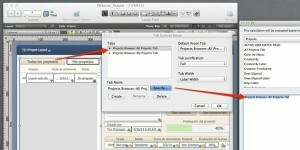 Learning this function will give you a great new tool in your FileMaker development. FileMaker 12’s new ExecuteSQL function opens up the power and flexibility of the SQL query language to any FileMaker calculation. 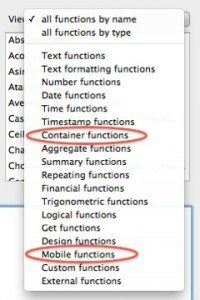 In this session from the 12 Days of FileMaker 12, we explore techniques for using the ExecuteSQL function within calculations to gather and manipulate data for reports, charts and dashboards. This video explores a variety of built-in and custom functions to slice and dice data in any context. We also cover the basics of the SQL SELECT statement so anyone can get started quickly. Greg Lane is VP of Application Development at Skeleton Key, a FileMaker Business Alliance Platinum level member in St. Louis, Missouri. He is a FileMaker 7, 8, 9, 10, and 11 certified developer and has enjoyed solving problems with FileMaker for more than 20 years. Greg has authored articles for FileMaker Advisor Magazine and has contributed to books, white papers, and other FileMaker-related publications. He is looking forward to speaking about FileMaker and SQL again at the 2012 FileMaker Developer Conference. 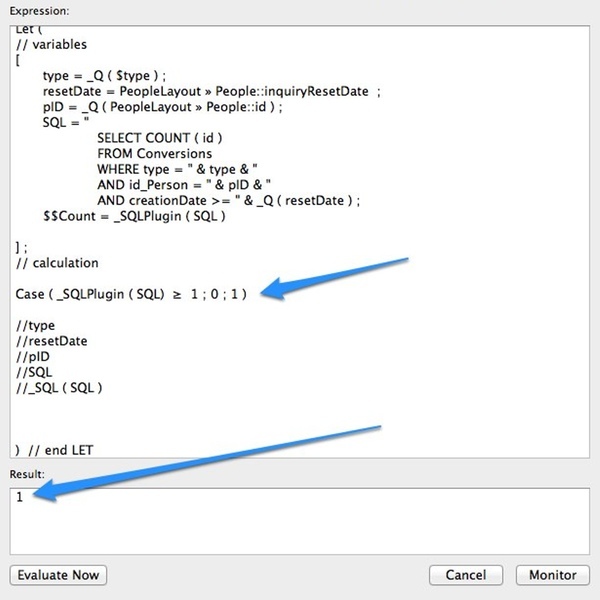 Probably one of the most talked about features in FileMaker Pro 12, at least from a developer perspective, is the new ExecuteSQL() calculation function. To users interacting with FileMaker records, this is largely a hidden feature. Yet this powerful new option impacts developers in several ways. Previously, developers used plugins to expose the SQL underpinnings of FileMaker. 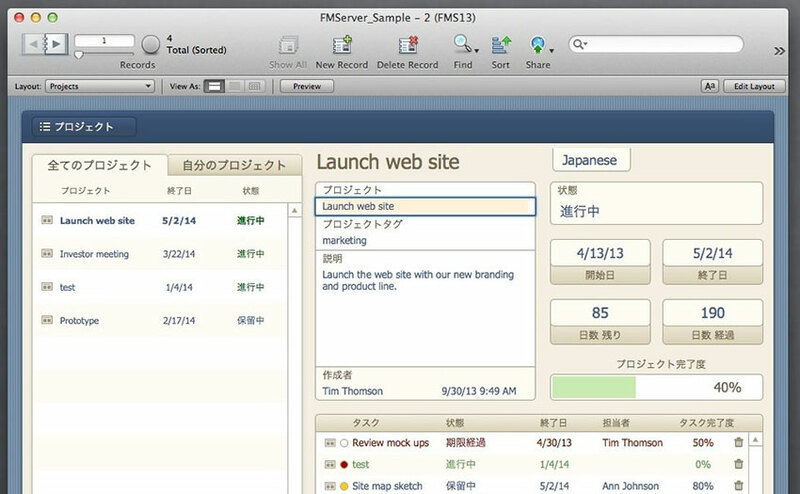 Now, a portion of SQL has become native to FileMaker. This portion is limited to the “Select” statement. Those same plugins remain viable options for developers who seek to insert, update, or delete records. The programming language SQL (Structured Query Language, see Wikipedia entry) centers on the query, or Select statement, to pull data from one or more tables. For developers new to SQL there are several books or internet resources available, yet the most concise and immediately useful tool is probably FileMaker’s own ODBC and JDBC guide. Starting with the most elemental of queries, and breaking down the Select query into multiple lines helps us visualize the different components of the query. We can then add more pieces as we master each section. We start with selecting a field from a table. It’s important to note that this statement selects the field name, not the value in the field. So if we said, “select Department from Contacts” we would get a list of all the departments in every record from the Contact table. You can also include mathematical operations or modify strings in the query. To count values you can use count(*) or count(field_name) for all records in the first instance, or only records that contain a value in the field_name. The Select statement works well in its basic fashion, but what we’re really after is the Where clause, combined with the ability to interact with multiple tables in one query. Rather than building complex relationships in the graph to accomplish the same result, we’re now able to solve this through SQL. When FileMaker Pro 11 introduced portal filtering we were able to simplify our graph and remove several Table Occurrences, and now with ExecuteSQL the graph can focus more on pure relationships, as this function is context independent. We can query table occurrences from anywhere in FileMaker, without having to navigate to specific layouts or rely on additional table occurrence groups. The next step along the SQL path is adding the Where clause and additional tables. The condition serves to limit the Select statement, as without it you would select all the records in the table. So, a simple Select statement with a Where clause would look like “select Department from Contacts where City = ‘Dallas'”. The sqlQuery is the query string – the select statement. Since this is text, we write this inside double quotes. The fieldSeparator and rowSeparator default to comma and return, so unless we need the result to appear in a different format we can simply use double quotes. The arguments is optional, but will be discussed further below. In this query we can count all the records in the state of Texas, using single quotes for the literal value of TX. Pages 55-57 of the ODBC guide list several reserved words. A few of these words might appear in your solutions as field names, such as “order” or “size”, or “First” and “Last” instead of FirstName or LastName (or NameFirst and NameLast). These words will need to be escaped in queries. In addition, field names with spaces also need to be escaped. Unlike MySQL, for example, the ExecuteSQL function will show just ? in the result if there is an error in your query, with no hint as to what caused the error. The arguments option allows the use of multiple arguments in the sqlQuery string. These arguments use the question mark as a placeholder, and are then listed in order in the argument section. Rather than using conditions outside the current record (i.e. State = ‘TX’), here we input values from a specific record, to see which books were published within a year for the author of the current book record. The ability to consider multiple tables falls under the From clause, but also in this action we must point back to the fields in the Select clause. These fields can be prefixed with the table name or alias. Adding an alias is useful as it reduces clutter in the query. With a table called Customers we can change this to from Customers C, and prefix the field as C.NameFirst in the Select statement. To query across multiple tables we “join” these with an equal sign (=), which will include only matching rows in the results. The new ExecuteSQL function opens up a multitude of possibilities. In scripting you can build queries across tables, populating variables for use in virtual list techniques. In charting you can gather data for dashboards in the same way, without having to jump to various different layouts and loop through records to summarize them. For tooltips you can provide information specific to the current record that looks across related tables. All this can be accomplished without adding a single new table occurrence. Once you start down the path exploring new features or technologies, often the deeper you dig the more cool stuff you expose. In my first post on SQL and FileMaker I focused simply on pulling and comparing data between tables. 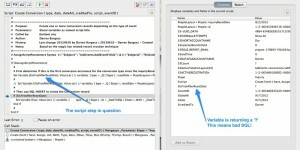 There are several advantages to employing SQL in FileMaker: speed and context perhaps the primary ones. While SQL the graph remains clean, as the queries remain inside the script, no additional Table Occurences are required. One area in FileMaker, where we tend to rely on jumping through hoops in the graph, deals with report creation. This is especially true when pulling together reports from multiple sources. Solutions require extra TOs to build queries through relationships, and significant scripting to hop between contexts and gather data. A recent game changer is Bruce Robertson’s Virtual List (see Lisette Wilson’s recent article and her follow-up for an overview), which gathers data into a utility table for the report output. Combining SQL and the Virtual List seems like a perfect marriage. Martha Zink, Advocate of Awesomeness at MightyData, recently showed me an example of SQL combined with the Virtual List. This post borrows heavily from concepts in her solution. Again, for the SQL queries I used a plugin. Several plugins expose FileMaker’s internal SQL. I selected MMQuery from CNS Plug-ins. One nice feature of its Execute SQL function is the ability to set your own delimiters between fields returned in the result. The default delimiter is the comma, but when returning number you may end up with extra commas and I set my delimiter to the pipe symbol. Other plugins may not have this feature, and require you to substitute the comma for the pipe symbol before sending the data through the Virtual List process. Although I’m not going to show long query examples in detail, I want to highlight one SQL idea used to build the queries that get sent to the Virtual List “engine”, and how to parse the output from SQL in order for the Virtual List engine to parse the data. The beauty of the SQL in Martha’s solution turns on an elegant and powerful technique in SQL: subselects. In essence, this is a query nested within another query. The advantage lies in removing joins, which makes the query more readable. Subselects also allow you to build result sets against which you then can run other queries. For example, imagine if you want to pull a list of fields using an ID value or set of IDs. You first want to get that ID set, and then you can select information based on this list. To illustrate this process I added some formatting. The key lies in bracketing the select that creates the initial result, and then selecting from this above the result. This “inner” query inside the parentheses is processed first. With “in” the outer query looks at a list of records. The inner select in the above example is a very simple statement. As with any other select in SQL you can change this to look across multiple tables, using multiple criteria, AND/OR, and other options. Using subselect is almost like creating virtual tables that exist solely within a query. Inside the <> would be all the fields required in the final result. In the solution that called for SQL, each report called for user-selected criteria, and searching across multiple tables. Relying solely on the graph or scripting to build the data would have required complex TOs and scripts jumping from layout to layout to build data, possibly even hard-coding criteria. By making the reporting dynamic, users could select from drop downs for different criteria, such as “single” and/or “double” graft. The query would build a pair of select statements, with the sub-select handling building a second list. While both queries end up fairly complex, imagine the complexity if she had to rely on joins to perform both queries. All of this takes place inside FileMaker, using (in her case) the SyncDek plugin for the SQL. Combine the power of SQL with the Rapid Application Development (cool interfaces) of FileMaker, and you get true development synergy. FileMaker Pro succeeds as a database system because of its many layers. As a rapid development database you can create a robust and elegant solution fairly quickly. Dig deeper, invest some time and effort, and you expose powerful tools and options that extend your solution. One such hidden tool is FileMaker’s internal SQL engine, which intrepid developers expose via plugins. You might ask why bother, since SQL is a complex language with specific syntax we must learn outside FileMaker. Also, almost everything that SQL does within FileMaker can be natively accomplished without adding plugins. However, I believe there are times when the power of SQL combines nicely with FileMaker to produce better, smarter solutions, and this makes learning and using SQL worthwhile. 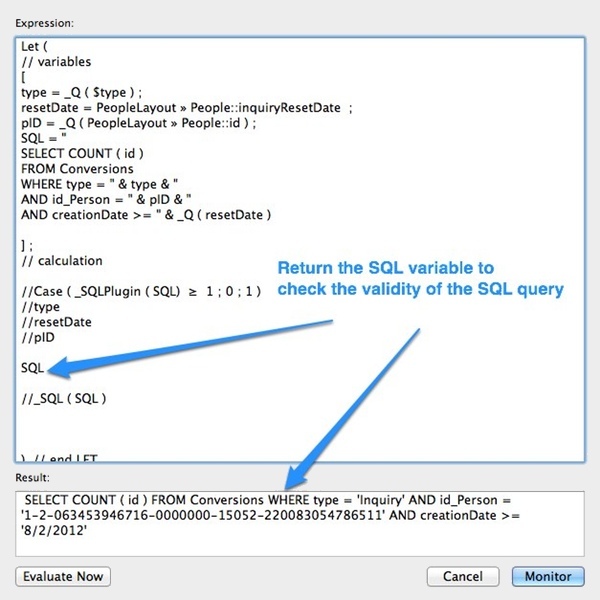 Some of the reasons to look at SQL in FileMaker include context-free queries, a simplified the relationship graph (fewer TOs in the graph), avoiding complex finds in scripts, and flexibility in building reports. In FileMaker, context is king. When creating or finding records through scripts, for instance, failing to start on the right layout could lead to drastic consequences. SQL removes these context constraints. For my testing I used MMQuery, and primarily its ExecuteSQL( query ) function. My task required comparing two tables with ca. 1 million records each and finding the records from Table A that were missing in Table B, and then make some adjustments to these records. Although I probably could have accomplished this in FileMaker, I like the elegance of SQL as it allows you to select data from various tables, and return only the results that you need. Never before having tried SQL in FileMaker, I started small, testing a basic query to discover constraints or differences in the SQL language from my experience with MySQL. While testing the SQL queries I discovered that the tablename in each SQL statement refers to FileMaker’s table occurrence name, not the base table name. In my project database, one of the tables I queried lacked a corresponding table occurrence with the same name. The first query resulted in an error that the table did not exist, and when I switched to a table occurrence name, the query worked. Table names are not case-sensitive, so if you have a “Contacts” table occurrence name, you can use “select * from contacts” and the query works. All text inside the square brackets are optional. I created a script to set two variables – a $query with “select * from contacts” and a $result with ExecuteSQL( $query ) so I could check these in the Script Debugger and use $result in subsequent steps in my script. The “*” in SQL is the same as “all” and gathers all the fields from all the records into the result. To narrow down the query you need to specify the field, or in SQL terms, the column. Querying across a single table requires just the column name, such as “select nameFirst from contacts”, but when querying multiple tables you need to include the tablename or table alias as a prefix to the column name, such as “select contacts.nameFirst from etc.”. But this query returns authors and titles that are in both tables, and I need the reverse. Using a LEFT JOIN produces the records that matches and those that do not match. Since this returns all the data from both tables, I need to isolate the records that do not match. In SQL terms these would be any records with NULL values in the related field, ie. the book.author_id. By adding a WHERE clause to limit the found set, the result is what I need. Using “author. *” instead of “*” also limits my result set to just the records from the author table. No joins are required in the relationships graph, and my script can execute the query from any context. The excitement of seeing values populated into $result from the SQL query–even the most basic of queries–told me that using SQL as part of FileMaker opens up new vistas in developing solutions. In another post I’ll cover another powerful feature of SQL called sub-selects, and how this can simplify complex reports.